Fall is a colourful season full of falling leaves, yummy treats, spooky costumes and fun with family and friends. 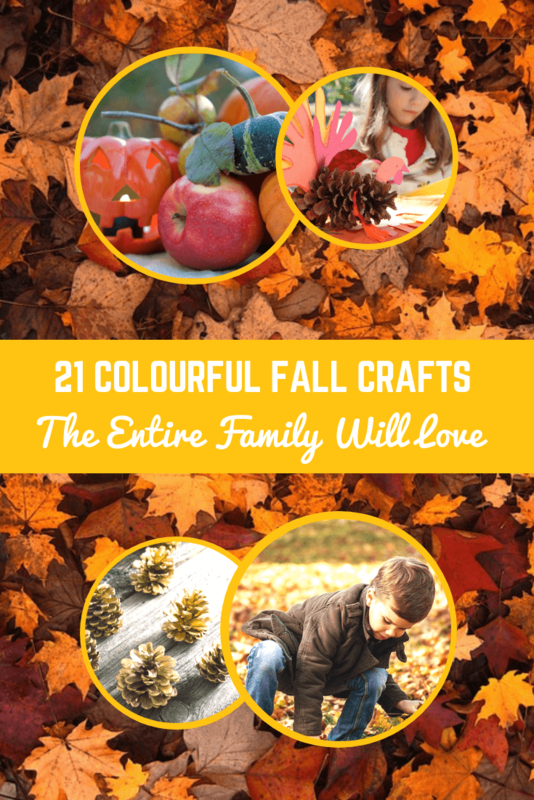 These 21 easy DIY fall crafts will bring the family together and help you make your home holiday ready! Ribbon wreaths are easy to make, and adding spooky colors makes them perfect for Halloween! All you need is a wreath base, ribbon and about 20 minutes of time. This easy fall activity is perfect for children, too! Are you looking for a crafty use for your mishmash of mason jar lids? Convert them to pumpkin themed jars. It’s a perfect idea for the fall season and looks good as a centerpiece or just casual décor. The idea is so simple and is a great way to recycle leftovers from past crafts. These twine pumpkins are both easy to make and unique in design. The entire project will cost you less than five dollars. You can display each pumpkin individually, bunch them together for a colorful twine pumpkin patch or hang them from a string and create a strand of garland. A book page pumpkin is a conversation piece and gives you a reason to upcycle those old, tattered books you’ve stored in the closet. It makes a spectacular centerpiece for Halloween and Thanksgiving, too! Turn your t-shirts into turkey icons and have fun with the whole family. In fact, you can make an entire set of matching turkey t-shirts. This Thanksgiving-themed-apparel requires felt, plain wholesale t shirts, fabric glue and minimal sewing. Little ones will love their new t-shirts that are sturdy enough to be worn again and again throughout the season. Create a beautiful, seasonal centrepiece with this fun alternative to pumpkin carving. Use pumpkins and candles of different sizes to create a glowing pumpkin patch to light up your home. The effect is colourful, warm and perfect for the season. Craft a beautiful cornhusk wreath to add a unique touch to your fall décor. It’s easy to make, so older kids will love to help! For added flair, paint the cornhusks in bright fall colors or add glitter for a touch of sparkle. Add sensational spook appeal to your front lawn with these eerie cheesecloth ghosts. It’s a fun idea that the entire family can get involved in. They’re so simple to make, easily allowing you to create an entire family of ghosts in an hour or two. Hang them from trees or display them inside your house. Either way, this spooky ghost family is the perfect way to say “Boo!” this Halloween season. Get the smaller children helping with this fun candy corn idea. With just pine cones and paint, you can create a variety of decorations that look great all season long. Hang the painted pine cones from a ribbon for a treat-themed garland, or pile them into a bowl for a colorful centerpiece for your table. Homemade trick-or-treat bags are a great alternative to store-bought candy pails, and your kids will love creating their own spooky designs! All you need is a canvas tote bag, paint and your little one’s creativity. What’s even better is that they’ll be durable enough to use them every year. Personalize them with your child’s name, so they don’t get mixed up or lost. Get the younger kids working on these colorful marbled-leaf creations. Design beautiful, leaf-shaped decorations from just paint, shaving cream and paper! Make as many as you want. The display options are endless, and it’s lots of fun, too. Add a fun and festive addition to your Thanksgiving season with a tulle turkey wreath. The entire project can be completed in under 30 minutes, and you can store the wreath after the holidays to use again next year. Gather up your old pine cones for some fun this season. Paint pine cones in an Ombre pattern for a unique, customized craft. They look great piled into a decorative bowl and used as a centerpiece. You can also add them to wreaths or other crafts to ramp up your decoration game. A paper bag turkey centerpiece is fun for toddlers and older children alike! It’s colorful and customizable, so you can make it fit any color theme. Your children will have a blast, and your table will look great on turkey day. This spooky wreath uses eyeball magic to make it one-of-a-kind. It includes small parts, but it is a fun craft for older kids and parents. The wiggly eyes are sure to give your trick-or-treaters a scare and add some Halloween flair to your home. Don’t leave your windows bare! These suncatchers are a great way to add color and a cozy fall feel to your home. Making leaf suncatchers is appropriate for the entire family, including the little ones! Create magic with your old egg cartons by transforming them into gorgeous sunflowers, and you’ll have something to show off for the entire fall season. Homemade egg carton sunflowers add a touch of nature to your home and are a great way to recycle those old egg cartons, too! They’re both fun and exciting for all ages. This floral fall wreath can be made in a matter of minutes and adds plenty of color to your curb-appeal. Use a foam ring from your local craft store and large thick-stemmed florals to create the colorful wreath. Hang it on your front door to make a friendly greeting to visitors. Candle centerpieces are inexpensive and simple to make. Find all the materials needed at your local dollar store to fill up your bare tabletops with something warm and special. Involve the whole family as you add glow and festive cheer to your home, making it absolutely ready for your planned fall festivities. Gold leaf pine cone garlands provide neutral décor that pairs well with any theme you’d like! They’re easy to make, and you and your family will have a blast searching outdoors for the pine cones. If you enjoyed these fall crafts, take a look at these 10 things you can do with autumn leaves!